By now we’ve all just about forgotten the hoopla and excitement about the winter solstice in 2012 and the supposed last day of the Maya calendar. As the world moves on to the next apocalyptic meme, I thought I’d take a moment to write about the ceremony I had the great honor to witness marking the end of the last Bak’tun and the seating of the new one. My friends at Yaxhá National Park in the Petén, Guatemala invited me to witness the ceremony with them and I am deeply grateful for all the generosity they have shown me over the last few years. The ceremony was performed part in Spanish and part in Mayan. It was very simple and staid. At times it was almost like being in church, only this church had the star-saturated sky as its ceiling. Although a much larger event occurred at Guatemala’s largest tourist site in Tikal the night before, one that included a light show, dancing and music, at Yaxhá things were much more subdued. The crowd and the location seemed better suited to contemplation. We hiked up to the site arriving at the plaza in front of Temple 216 at about ten minutes to 5:00 am. Already a fairly large group of people was gathered watching the Shaman and his assistants prepare the ceremony. The Shaman dressed all in white. He wore red kerchief around his head and a Maya style belt swirling with colors. With him were four assistants, another shaman in white, two boys and a girl no older than 14 or 15. In the dark, using only the light from a burning piece of husk, the Shaman drew a circle made of sugar in the center of the altar. Then he divided the circle in half with a line down the middle, also made of sugar. He then covered the sugar with round blocks of copal incense. Again he made a line through the circle with sugar going the other direction. After completely covering the circle with blocks of copal he placed the four candles at the four cardinal points (red to the east, yellow to the south, black to the west, and white the north). 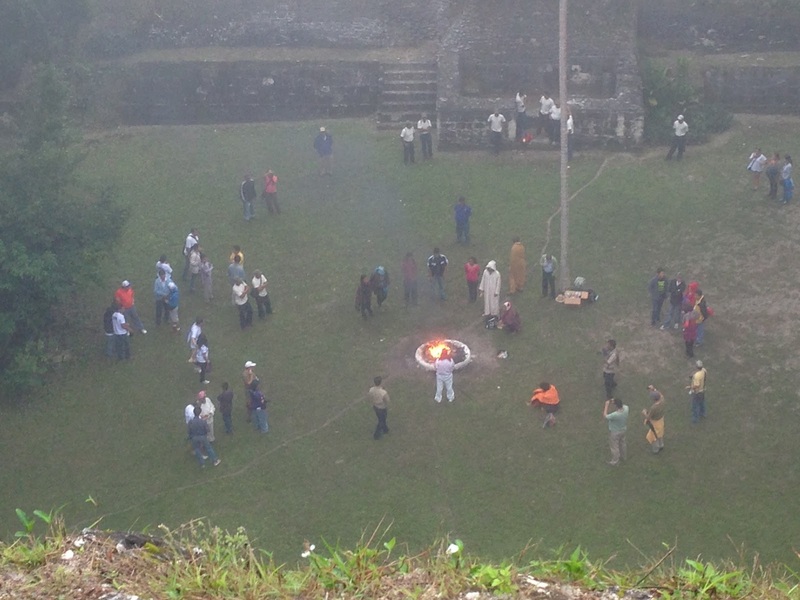 A green candle marked the center of the circle. I saw what I thought were large cigars, but I never smelled any tobacco so I can’t be certain they were in fact cigars. At the side of the altar he placed bottles of Fanta (yellow & red), vodka (white) and coca cola (black) along side the candles of the same colors. When the Shaman lit the candles and the copal incense in the center, he asked us to make a large circle around the altar in a single line so no one would be in front of anyone else. The smoke was dark and heavy, but not impossible to breath around. The Shaman told us that he would perform his ceremonies at the base of the temple, not at the top. He explained the Maya believed that the sun, at that moment was making its passage, through the underworld and that it would soon rise. He compared each stage of the sun’s passage through the sky to the life a human being. Infancy, youth, wise elder and death. The Shaman first knelt toward Temple 216 said some prayers in Maya (which I could not understand) and kissed the ground. He then began by explaining the intricate interlocking nature of the calendar and how the Maya paid very careful attention to the movements of the sun and the stars. Then, beginning with the first day name he explained the word’s meaning, which god ruled over that day and all the gifts that god is responsible for sharing with human beings. 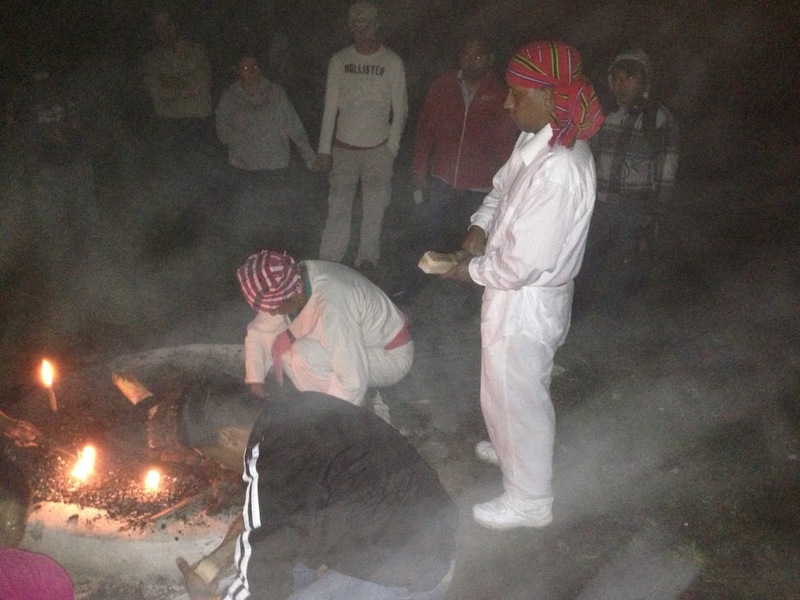 Then he offered thanks to the god, and as we all counted to 13 together, the Shaman threw a pinch of ajonjoli (sesame) seeds into the fire with each number. He explained that we were naming each of the gods and thanking them for having stood steadfastly for the last 13 Bak’tuns. At different points, the Shaman gave each of us a handful of seeds to throw into the fire. At other times he and his assistants passed out small candles of red and yellow (some people received black and blue) to throw into the fire. The ceremony lasted about an hour and a half, and the Shaman spoke almost continuously, the whole time, explaining what he was doing and why. As the sun came up he explained that the new era would begin at the moment of dawn. The new day would be numbered zero, not 1. The shaman came from a nearby village and had been invited by Yaxhá to perform the ceremony for them. He told me that he often performed ceremonies at the site. 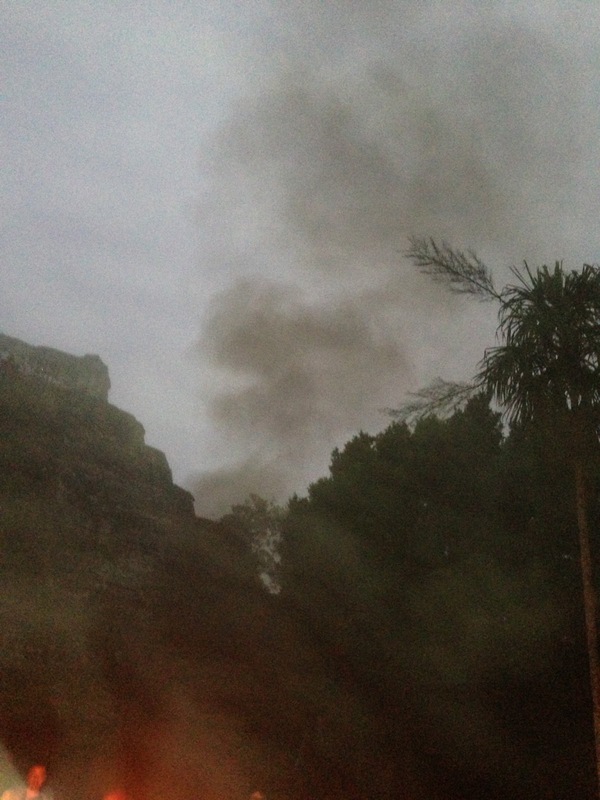 When I returned to the base of Temple 216 later in the day, the altar was still smoking. I am a writer and a school librarian who has a passion for all things Maya. This entry was posted in Maya Calendar and tagged 2012, Maya. Bookmark the permalink.